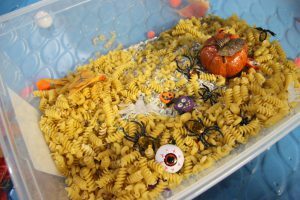 Home » Occupational Therapy » What to do with Halloween Leftovers? Now that Halloween is done, most parents are looking a the left-over Halloween stuff and pondering whether you can toss it all yet? 1. 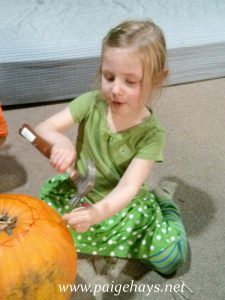 Hammer and nails with old pumpkins- grab a handful of nails and a hammer (or golf tees and a toy hammer) and let your child enjoy hammering away. This task is great for building eye-hand coordination and bilateral skills (using two hand together). 2. 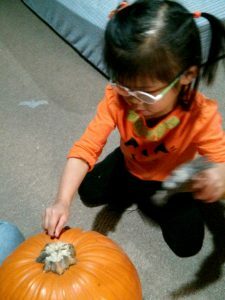 Paint a pumpkin- put down some newspaper and give your kids a paint brush and paints to re-decorate their old Jack-o-Laterns. Read here to learn more about how painting on real objects helps build developmental skills. 3. Save all the little grab bag items to put into sensory bins. Things like small spiders, fake teeth, eye balls, erasers, or other small items. Toss them in with a bin or rice or beans and let your kids enjoy. Add in some spoons, tongs, or cups for more challenge and skill development. When the kids are done, pack up all the small items into a bag to re-use next year. Learn more about sensory bins (how make them and their developmental benefits) in this post.